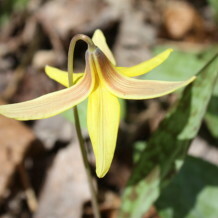 Spring is finally arriving in Glen Providence Park – soon flowers will emerge, and bird song will fill the woods! Learn to identify those birds and flowers while enjoying a morning walk through the park. We’ll see if we can add to the 105 species on our Glen Providence Park Bird List, and see what is blooming along the way in this late-emerging Spring. This bird walk will be led by Al Guarente of the Birding Club of Delaware County (BCDC). Al is a wealth of knowledge, and has helped us identify birds from our photographs. He has led three bird walks for us so far, in February 2012, November 2012, and June 2013. Al contributed to our 2012 Birding Big Year, in fact he announced it on the BCDC blog before we did! Our wonderful native plant expert and garden coach Marcia Tate will also help us look for native ephemeral (short-lasting) flowers, buds, and other signs of Spring. Appropriately enough, this falls during Transition Town Media’s Happiness Week – what could be happier than looking for Spring birds and flowers?